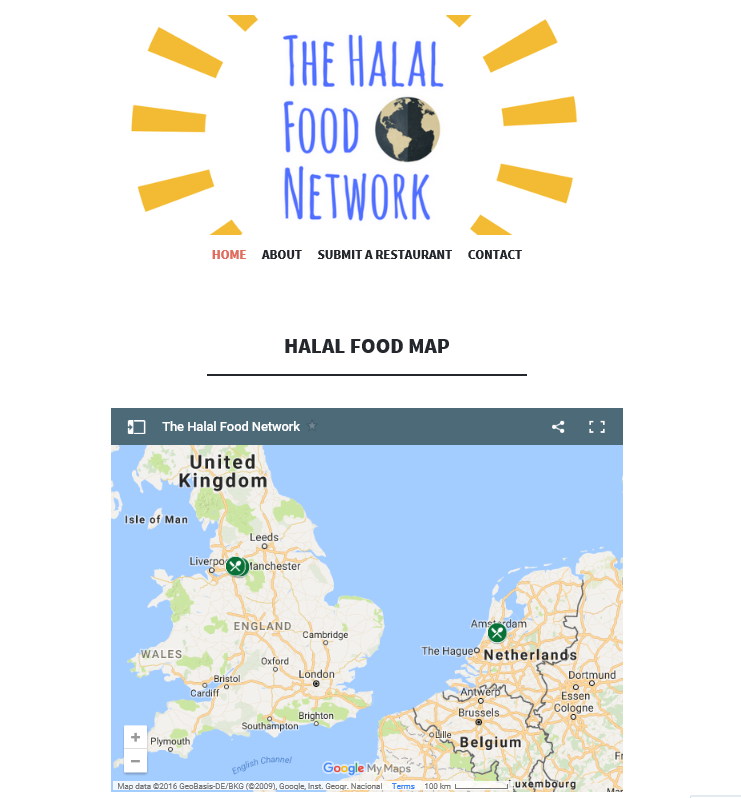 New website: The halal food network -Help us! Bit of a roundup: We landed late on Friday, caught up with work Saturday, spent the day at BlogOn on Sunday (which I can’t wait to write about), back to work on Monday and then the new Scene menu launch on Tuesday, it’s literally been non stop. Whilst we were away, I was scheduled to launch a new Manchester specific google map on the blog, on the 19th of September. A severe lack of good internet access meant it didn’t go ahead as scheduled. (I needed to do some tweaks before it went live), BUT I think that was secretly a blessing in disguise… as it gave me a few extra days for a new idea to dawn, which I’m very excited to share. Now, I’m afraid this won’t actually appeal to everyone, as the project is specifically designed to help Muslims. However, you may have someone in your life who could benefit from this service, so don’t be too discouraged… (and who knows what it could lead to in the future). For those who aren’t aware, Muslims, like other religions have certain criteria regarding what we can and cannot eat. Our meat has to be halal (prepared in a certain way) and we do not eat pork. In my ‘About Me’ page, I mention how a lot of my Muslim friends and family choose to travel to Islamic countries, usually because they have good access to halal food. Whereas Mo and I go anywhere the wind takes us, we’re both super adventurous with cuisine (within the confines of our religion), though having meat every meal is not always essential for us. However, when you’re away for a long period of time and you’re not accustomed to a vegetarian/pescetarian diet, or when you are in a country that has a very meat influenced local menu, it can be particularly testing. My partner in crime, G, and I have decided to create a network which is aptly called: The Halal Food Network. And together with Mo and my darling sister, we are launching it live – TODAY. The concept, well it’s really, really simple. With over one billion Muslims across the globe, we want to call on as many of you as possible – in all sorts of towns and cities to join our group and help us to create one giant super map. A super map that allows you to zoom in on wherever you may be and at any given time and search for halal eateries nearby. We have launched a Facebook group, which we encourage you all to join, to engage in conversation and become part of a community aimed at helping each other out. We’ve created a VERY simple form for people to submit restaurants that they know are halal, or even quite simply have a few halal options. We’re not putting any ‘halal’ criteria as we want to trust our friends in the network and ask that everyone do their own small check before visiting anywhere to make sure it lives up to their own personal ‘halal’ standard. (Takeaways can be added too if restaurants aren’t available). My team and I will then upload each entry onto the map in batches for all to use. If you’re interested in following our journey (wherever it may lead), but do not want to be involved in the conversation, then we’ve set up a page where we’ll be sure to post up each new batch of restaurants that has been added and any other news that might come up, from time-to-time. We want this to become a tool that eventually anyone can use wherever they are in the world. We’re not making money from it, we’re not out for anything – other than to encourage Muslims to travel the world, to discover and to experiment in a manner that is permissible! Where’s the map you say? I’ll keep one handy on my side bar too, but the main one will live on our site. We’ve got lots of ideas to build on this and I’d especially like to hear from bloggers (or ANY individual!) from anywhere in the world who may be able to contribute a large number of establishments. Please do drop me an email if you’d like to get involved and I’d be happy to share some of our upcoming ideas: thehalalfoodnetwork@gmail.com – let’s work together!! So, what do you think? Are there any other great food networks out there who have already achieved this? Vegetarians? Vegans? Coeliac’s? I’d love to see and share them! (Even contribute if I can).